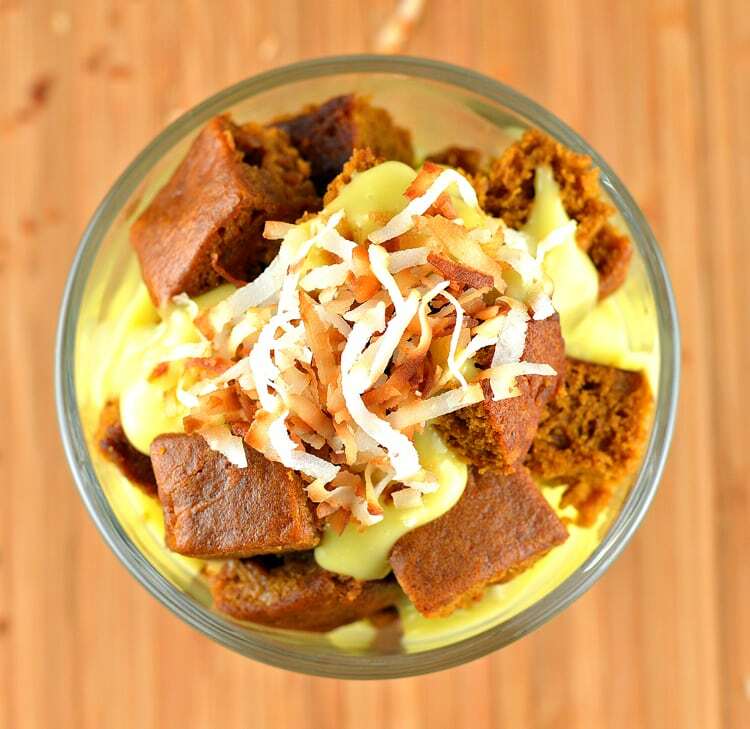 I know what you are thinking…there is no way this Pumpkin Gingerbread Trifle could possibly be vegan. Believe it or not, it actually is! 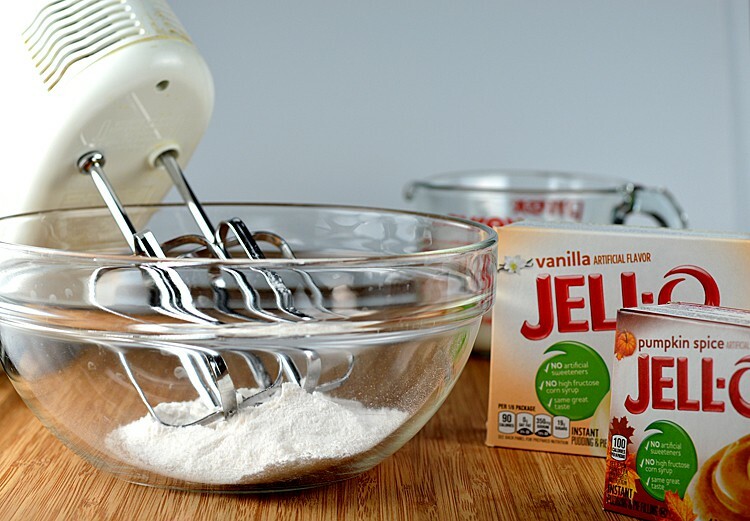 Several flavors of JELL-O® brand puddings are “accidentally” vegan, including the seasonal Pumpkin Pie and classic Vanilla. The pumpkin spice pudding is added to our pumpkin gingerbread recipe and is drizzled with copious amounts of vanilla pudding. Toasted coconut tops this simple holiday dessert. Use either a large trifle dish or, if you can find them, these smaller individual serving sized dishes which I think make for a really elegant presentation. Either way, your guests will not be able resist digging into this one. Since uncooked puddings typically do require full fat milk to thicken and state on the box that they will not set with soy milk, a little tweaking shows us that by simply reducing the amount of non-dairy milk works…beautifully! 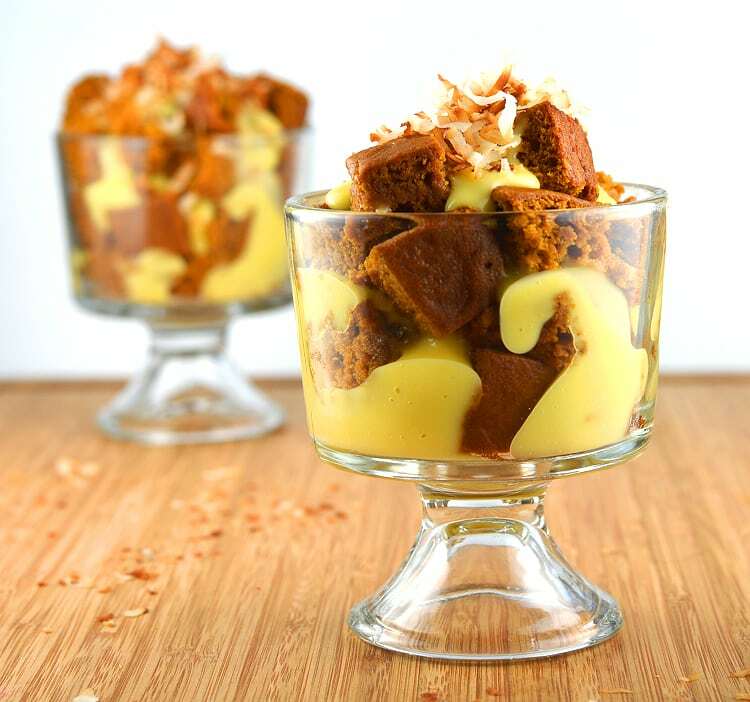 I found everything I needed to make this Vegan Pumpkin Gingerbread Trifle at the Kraft® Holiday Bake Center in my local Scottsdale, AZ Walmart. We used the JELL-O® Pumpkin Spice Flavor Instant Pudding, JELL-O® Vanilla Instant Pudding and BAKER’S® ANGEL FLAKE Coconut as the featured ingredients in this recipe. During the holidays, we are all looking to save a little money and this dessert thankfully falls into our ‘Vegan On A Budget’ series. The puddings each cost about $1 and the coconut came in around $2.50 (you will have leftovers for use in other recipes). I purchased a can of pumpkin and then using items already in my pantry, found that this entire recipe cost me just under $5.00 to make! Toast the coconut in a small fry pan and assemble this dessert just prior to serving. 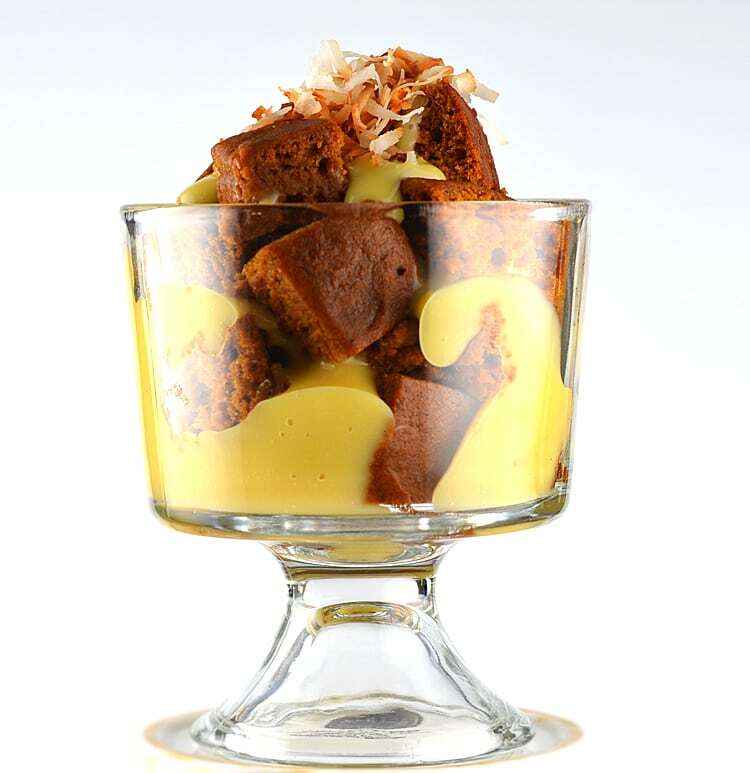 The spicy gingerbread pairs nicely with the sweet velvety pudding and you also get a nice little crunch from the coconut. 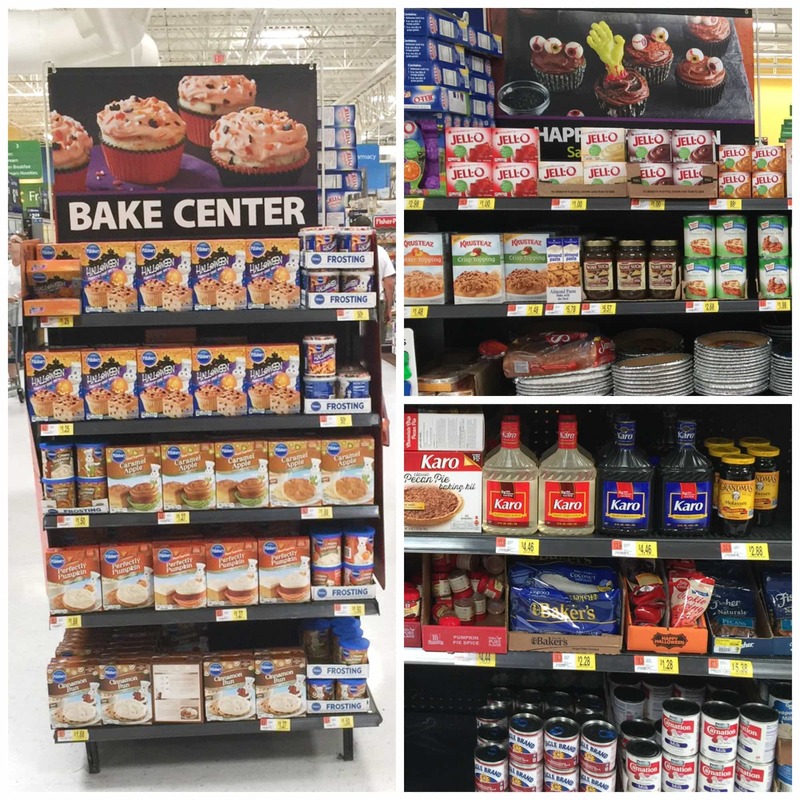 For more information on the Kraft® Holiday Bake Center at Walmart, please click here. Prepare a 9x13 baking dish by spraying with nonstick cooking spray. Beat the pumpkin, brown sugar, molasses and softened non-dairy margarine in the bowl of an electric mixer on medium speed until well combined. In a separate bowl, combine the flour, baking powder, baking soda, 1/2 package of the pumpkin pie pudding, and additional pumpkin pie spice, if desired. Whisk well to incorporate. Add the flour mixture to the pumpkin mixture in small increments and alternating with the boiling water. Beat on low speed after each addition. Spread evenly into baking dish and bake for approximately 35-45 minutes or until a toothpick inserted comes clean. Meanwhile, to prepare the vanilla pudding, add 1 C of VERY COLD non-dairy milk to the pudding in the bowl of an electric mixer. After two minutes, if it is already getting thick, add a bit more milk. After 5 minutes of beating, it should start to look like pudding. Refrigerate for at least 1 hour where it will reach a thicker consistency. 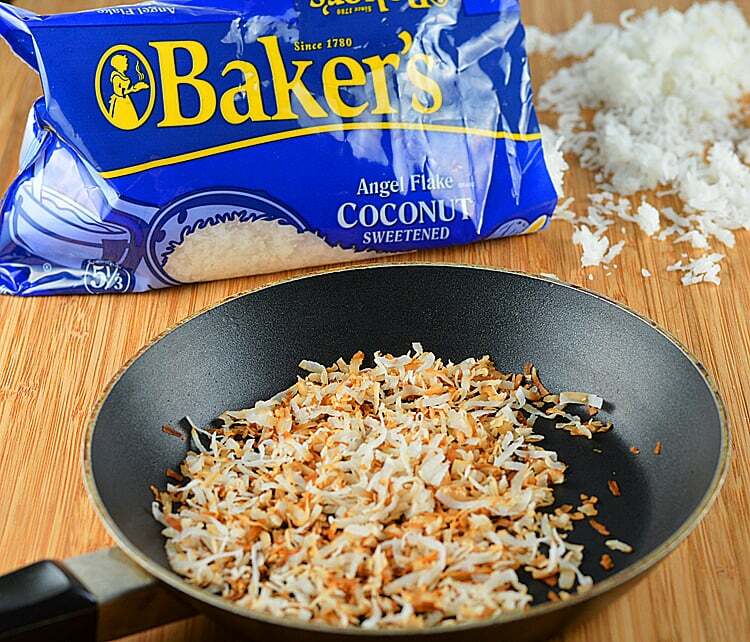 In a small fry pan, slowly toast the coconut flakes to a golden brown. Set aside. Once cooled, cut the cake into 1" cubes. 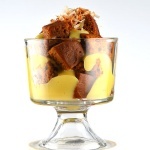 Layer the cubes into the bottom of your trifle dish, then the pudding and repeat. Top with a bit more pudding and the toasted coconut flakes. I can’t believe this flavor of jello is vegan!! I’ll have to give it a try!